So. Everyone travelled down the thoroughfare (road) and into the substantial edifice (large building) on Wood Quay. It was a temperate (warm) morning and the celestial canopy (sky) was a fetching azure hue (blue). In other words, they got a grand day for the launch of their venture (venture). For until the official unveiling of the latest awfully big venture yesterday, there was nary a mention of the p-word (party). The p-word was barred altogether. For let's face it, the field is becoming more crowded than a big day out at the Ploughing, what with alliances and movements and groups splitting and forming and reforming to beat the band. And now the Social Democrats have joined the melee, hot on the heels of Lucinda's Renua and Shane Ross's Independent Alliance. 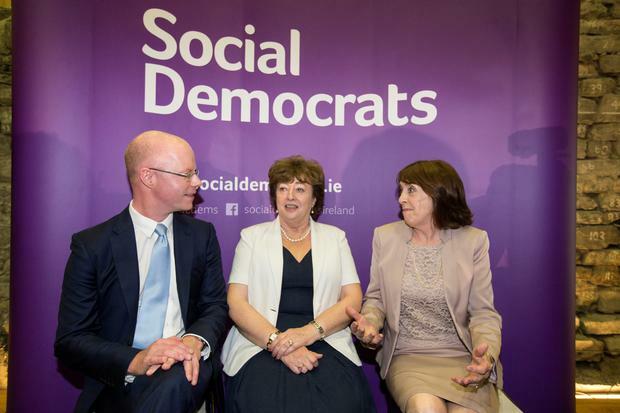 Yet despite the gridlock of launches in recent times, the trio of former Labour junior minister Róisín Shortall and Independent TDs Catherine Murphy and Stephen Donnelly were the objects of considerable interest. The three presented themselves on the podium, making short speeches against a backdrop of their new purple logo, all smiles and honeymoon collegiality. Certainly, given the disparate personalities of the TDs, they all appeared to be getting on famously. They even all exchanged a couple of awkward, first date-style hugs. "It's now my pleasure to pass you over to my new party colleague, Catherine Murphy," beamed Róisín. "It'll take a bit of getting used to, that terminology," confessed the hitherto-Independent Kildare deputy. And it seems that the political friendship was forged over multitudinous cups of coffee in Róisín's kitchen. "It was very good coffee," explained a jolly Stephen. Perhaps they should've named their venture the Social Demitasse. But in fairness it was clear that over the vats of lattes in Chez Shortall, they had put considerable thought into their new project. Each gave a short speech which centred on different policy areas; Róisín zoomed in on issues relating to childcare and child poverty, Catherine spoke on political reform, and Stephen focussed on the mortgage arrears crisis and on supports for Irish businesses. There was of course a bit of inspirational rhetoric to woo the beady-eyed and disgruntled electorate. But doesn't the Labour Party describe itself as a "democratic socialist party"? So, given that both Róisín and Catherine once were in Labour, are they just the Labour Party in exile? Catherine Murphy explained, "We're calling ourselves a very simple, honest name that describes exactly what we intend. We're not seeking to replicate the Labour Party," she insisted. Likewise, when asked if it might've been easier just to re-join Labour rather than go through the whole palaver of setting up a whole new party in an increasingly gridlocked field, Roisin was icily clear. "That was never a consideration; that just simply didn't arise," she said. "What we're about is setting up a modern party that puts openness and fairness at the centre of it. That's not happening in the Labour Party at the moment." It's clear that what with Renua camped out on the right wing, and a gaggle of far-left groups jostling for pre-eminence, the Social Democrats will be eyeing up the disillusioned Labour voters who, the polls would suggest, are legion. On the plus side, they have two female TDs and one male deputy, so they're ahead on the gender quota issue already. But as yet they have no other candidates, and no funds. But none of them have paid their water charges or at least Stephen doesn't think he has, having moved house three times in seven months. Sure they can start a kitty with the few quid they've saved from not paying the charge, plus the €300 water Conservation Grant they'll collectively get from the Government in September. Now that's democracy in action. Enda will be delighted.